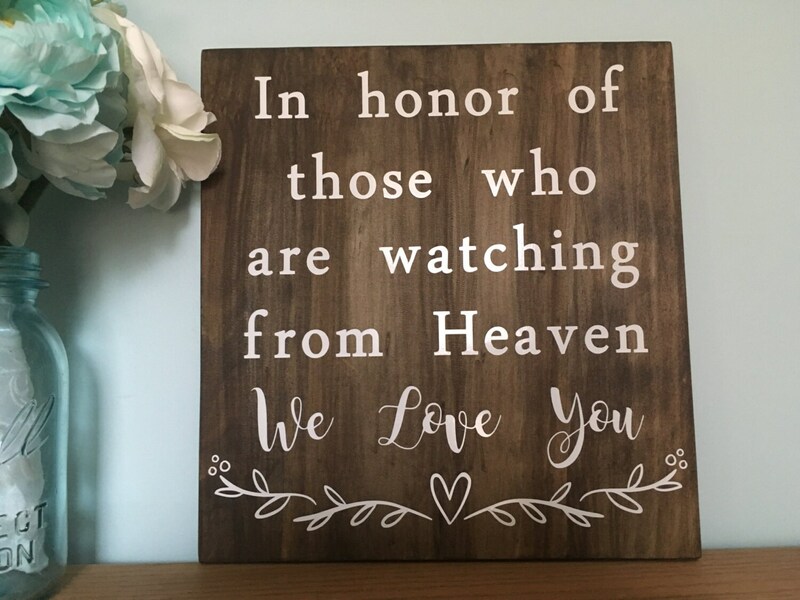 The sign reads: In honor of those who are watching from Heaven. We Love You. * WHAT YOU GET * One stained board with personalized white outdoor vinyl detail. * WHAT YOU DO * Just select to amount you will need. **********************************************************************************************************************Please note that lead time is the time it take me to make your sign THEN it will take USPS 3-5 business days to arrive. Please visit my shop to see if there are any other items that would fit your wedding needs!! How many signatures can the guest boards hold? All of my guest boards are 16" x 24". They can hold up to 100-125 signatures comfortably. ****Please note that lead time is the time it take me to make your sign THEN it will take USPS 3-5 business days to arrive. For rush orders: If you order MORE THAN ONE item you MUST select rush order on BOTH listing. What do I use to sign my guest board? I find that metallic sharpies sign the boards the best (vs pens and paint markers)! The writing always comes out crisp and clean. Any orders OVER $100 will have a signature confirmation. Do you provide mock ups? Mock ups are provided upon request. Can I change the wording on the sign? Yes! Just drop me a message before purchasing.